In an address at the opening session of the BRICS Business Forum on Sunday, Chinese President Xi Jinping said the global economy is “still not healthy enough” and that economic globalisation is facing many uncertainties. 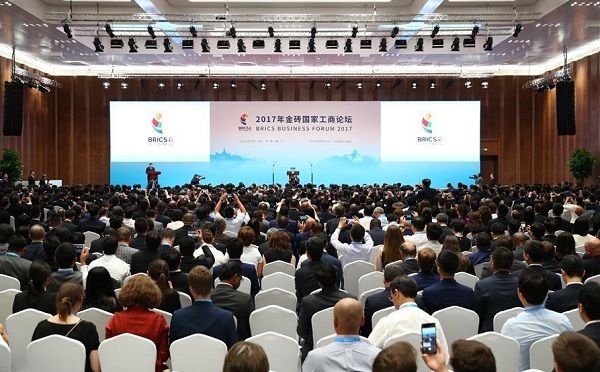 1200 industry representatives from the BRICS nations and other countries were in attendance at the Xiamen business forum. Brazilian President Michel Temer and South African President Jacob Zuma also attended the meet. Responding to critics of BRICS, Xi said, although the five economies “have encountered headwinds of varying intensity but the growth potential and growth trends of these countries remain unchanged”. “In the past 10 years, BRICS combined GDP has grown by 179%, trade by 94% & urban population by 28%,” Xi said on Sunday underlining the growing clout of the bloc. BRICS, Xi said, are not a talking shop but a task force that gets things done. “The New Development Bank and the contingency reserve arrangement have provided financing support for infrastructure building and sustainable development of the BRICS contributing to enhanced global economic governance and building an international financial safety net,” Xi noted. The $100 billion BRICS Contingent Reserve Arrangement (CRA) became fully operational following the inaugural meetings of the BRICS CRA Board of Governors and the Standing Committee in the Turkish capital of Ankara in 2015. Aside from the BRICS Bank and the BRICS monetary fund, the bloc will also discuss a joint energy platform, according to Russian President Vladimir Putin. On Sunday, Xi reminded the audience that BRICS seek a multipolar world. “Our world today is becoming increasingly multipolar. The law of the jungle where the strong preyed on the weak and the zero sum game have been rejected,” Xi said. “BRICS cooperation is a natural choice made by our five countries. In the past decade, we, the BRICS countries, have surged ahead and become the bright spot in the global economy…BRICS future cooperation must be based on “treating each other as equals”, Xi said.